I was going to wait until the morning of the election to make my final prediction for the 2012 elections, but I’m inexplicably getting a lot of emails asking whether I’ve changed my mind since I predicted last month that Obama would eke out a narrow 271-267 victory. So I’m going to cave to peer pressure and make a next-to-final guess about the outcome. But my GOP friends won’t be happy, because the only thing I’m changing is that I’m putting Nevada in Obama’s column. You’ll also notice I’m hedging my bets by putting lots of states in the “leaning” category. Depending on how these states break, we could get everything from a 332-206 rout for Obama to a comfortable 301-237 victory for Romney. I’m curious, by the way, to see who readers support. Please vote below, and feel free to add additional thoughts in the comments section. This is a highly scientific poll (at least by the standards of the global warming cranks who say that “climate change” causes AIDS and that skeptics are racist). Next Tuesday, I’ll include my predictions for the House and Senate when I make my final guess about the presidential election. Not to brag too much, but I was right on the mark in my prediction for the U.S. House and off by just one seat in my prediction for the U.S. Senate. P.S. I’ll be very happy next Wednesday because the political silly season will be over and we can get back to what really matters – figuring out how to control the burden of government spending, how to implement much-needed entitlement reform, and how to fix the corrupt tax system. I have Romney winning 285-253. Difference between our maps is I have Romney winning Ohio and Iowa. Does anyone think it is fair that Obama’s input to hurricane Sandy should be a point of evaluation in who wins the election of President? I personally do not think that should sway voters as it is unfair to Romney. I think it will be a comfortable Romney win because 1) the polls have all incorrectly written off the evangelical vote using the same metric as in 2008 and, 2) Democrats are not only less enthusiastic but many are openly hostile because of Obama’s feckless performance. Regardless we haven’t heard the last of Barack Obama. Even if he loses and never surfaces as a candidate again his destruction of some of our most important laws and precendents during the GM and Chrysler bailouts will continue to haunt us for years to come. Then too liberals will immediately send up a blizzard of litigation to block any substantive reform of the disaster they’ve created. Might as well make my predictions. 279 Romney- 259 Obama… or a possible 299 Romney- 239 Obama, or 281 Romney- 256 Obama, Either way Romney wins! Just my predictions. I’ve got a good feeling. I feel Romney will win, because when push comes to shove, in the end enough people will vote Romney. Silent but deadly… many people simply do not blab who they vote for. We’ll find out. If I’m wrong and Obama wins, then we all can kiss many of our freedoms good by. Some will revolt- not me, as I’ll be looking out for #1. It will be too late- Obama will sink us, and no sense fighting for a lost cause. Many who voted for him will be in shock! So the only thing left to do is survive. And do whatever it takes to. I mean whatever. Romney is the only chance we have to make a come-back. With Romney you will still be free. With Obama a slave to the Big Brother government. The truth hurts. Our country today is in a bad way- how could anybody vote for Obama? Romney is a successful business man. He can fix America and you will have opportunity again. Obama will feed you crumbs to buy your Soul, then shear you for the rest of your life. I pray Romney wins. Save America- vote Romney! Any numbnut who votes for the looney Gary Johnson deserves an Obama win. There is no more mindless a vote that one could make than one for Johnson. Where i live we all hate obama he is killing our jobs here in southwest VA. .I pray to god Romney wins!!!!! Over at PJ Media they have a catagory of voter known as BGV meaning they would crawl over broken glass to vote for Romney. I’m in that catagory. 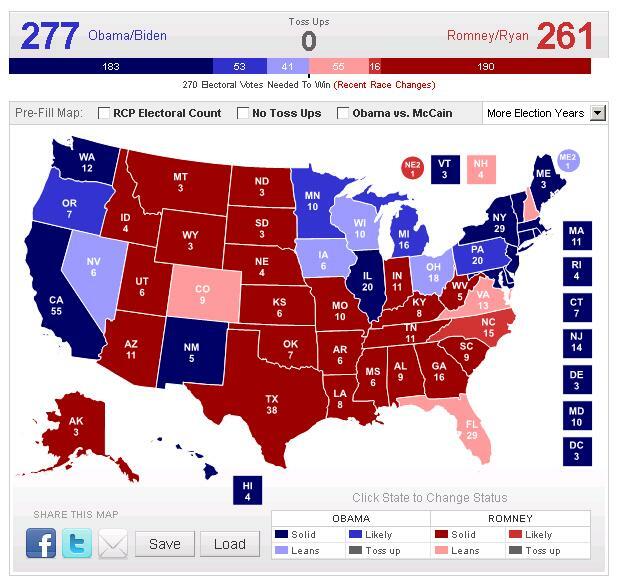 This is a reasonable prediction, as is just about anything in that range you suggest (330 Obama to 301 Romney). If the Senate seat you missed in 2008 was the Minnesota one, I think you should claim you got a perfect score. That was one questionable election. “I’ll be very happy next Wednesday because the political silly season will be over and we can get back to what really matters – figuring out how to control the burden of government spending, how to implement much-needed entitlement reform, and how to fix the corrupt tax system.” If your prediction comes to fruition and Obama is re-elected, your sentiments become a moot point. I want these things as badly as anyone, but a 2nd term for Obama throws everything out of the window and and will send big government and high taxes into overdrive. We become Greece (or worse) at that point and it won’t matter. Game over. I would flip Ohio, Wisconsin and Iowa to the Romney column. Then Romney wins 295 electoral votes to 243 for Obama. on November 1, 2012 at 12:40 pm A. L.
Intrade worked — until they figured out how to game it. Dan, you know a lot and mostly I agree with you, but you are in Washington DC and you see the country from behind that wall. I am in the equally blue Other Washington and I see something quite different. Romney might not win here, but the margin will be much much narrower than expected and down ticket goes red. Lots of volunteers here from safely red states and almost no Obama signs anywhere. I believe that Obama will win. Just follow Intrade! I’m not a Republican so what I predict is not biased by my preference. It’s Romney in a comfortable win. Everything is breaking his way now that thoughtful Democrats have realized that Romney is a moderate Democrat.